Enjoy a peaceful rural surrounding at one of our four star cottages situated in a courtyard of converted farm buildings in the beautiful Vale of Glamorgan and the easily accessible scenic Heritage Coast and St Fagans Museum of Welsh Life. All of the cottages are fully furnished, well equipped and fully heated for all year round comfort. 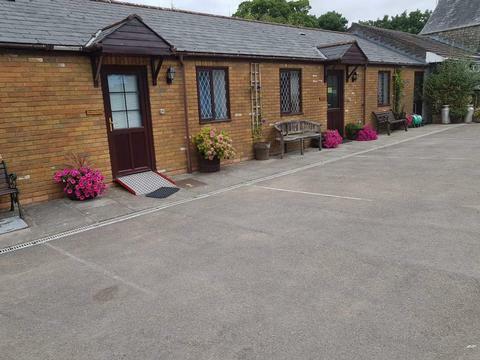 Two of our cottages are Level 3 disabled category. They have modern kitchens and bathrooms and a comfortable living/dining area. All have a TV and WiFi. Hot water, central heating and electricity is included in the price. An outdoor seating area is available to the rear of each property. The three bed-roomed cottage sleeps 5/6 people and has a spiral staircase to the first floor level. A washing machine and dryer is available in a separate utility room. We are the nearest rural self catering cottages to the beautiful Capital City of Cardiff, the Millennium Stadium, Millennium Centre and Cardiff Bay with all of its attractions. The Vale of Glamorgan and the Heritage Coast are two of the most scenic areas in Wales. The easily accessible coast offers fantastic views and sandy beaches with activities ranging from horse riding, fishing, cycling to walking. Cardiff, Cowbridge and MacArthur Glen Designer Outlet are great for shopping with abundant temptations for everyone. While for dining out there is an excellent and diverse range of restaurants and country pubs to choose from. Children enjoy experiencing a farm environment with cows and horses in their natural habitat. Contact Sue Trivett for Enquiries and Availability.